Rangpur Riders are expected to bag their 3rd win of the season leaving the hosts Sylhet Sixers in misery again. In their first home game of the season, the Sylhet Sixers faced embarrassment as they were bundled out for just 68 runs while batting first. Alok Kapali scored an unbeaten 33 with four fours and a six while all the remaining ten batsmen got out for single digits including ducks by David Warner and Nicholas Pooran. Thus, they recorded the first instance in the Bangladesh Premier League history where all the ten batsmen got out for single digits. 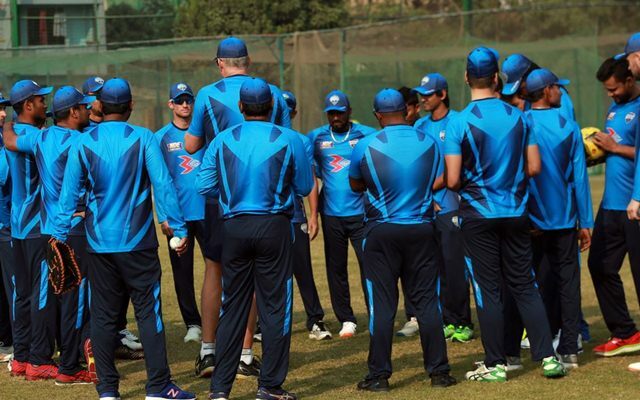 They will be hoping to put on a better show in the game against Rangpur Riders. The Mashrafe Mortaza-led defending champions have won only two of their five matches and will be looking to start the Sylhet-leg matches on high. The Rangpur franchise will be hoping to see Chris Gayle gain some form and back the heroics of Rilee Rossouw. They will be boosted by the inclusion of AB de Villiers by end of this week. 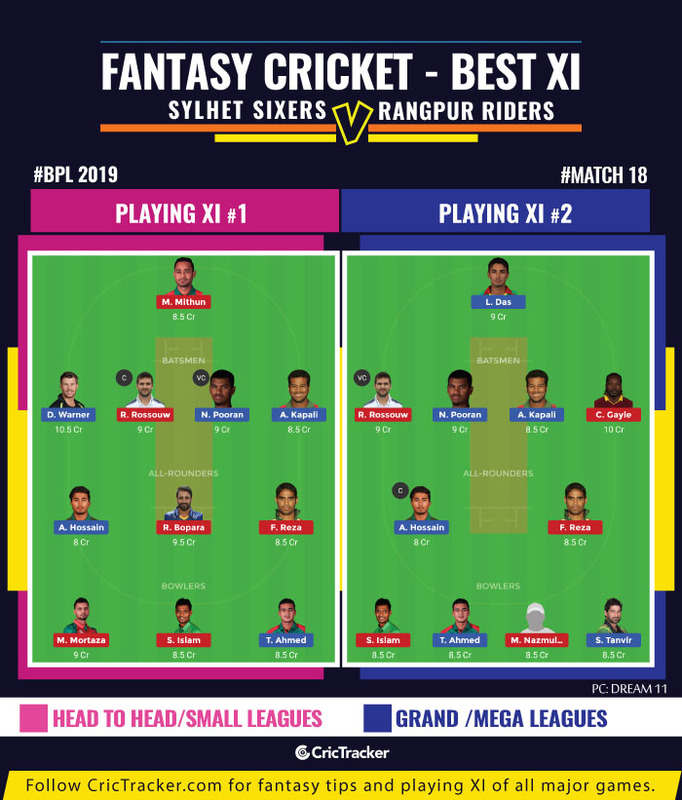 The 18th match of the Bangladesh Premier League (BPL) 2019 will be played between Sylhet Sixers and Rangpur Riders at the Sylhet International Cricket Stadium. The Sylhet track was expected to be better than that in Dhaka but the first day at the venue turned out to be a nightmare for the batsmen. The track got slowed down as the day progressed and Sylhet were seen getting bowled out for just 68. The average first innings score at this venue read 181 from the five evening matches before this tournament. The batting first teams won comfortably after posting 200+ in three of the five matches but lost where defending scores of 135 and 154. A better track is expected in the coming days. Nasir Hossain, Sabbir Rahman, Liton Das, Sohail Tanvir, David Warner, Sandeep Lamichhane, Afif Hossain, Taskin Ahmed, Al-Amin Hossain, Towhid Hridoy, Fabian Allen, Mohammad Irfan, Nabil Samad, Ebadat Hossain, Alok Kapali, Jaker Ali, Gulbadin Naib, Andre Fletcher, Mehedi Hasan Rana, Patrick Brown, Nicholas Pooran. Mashrafe Mortaza (C), Nazmul Islam, Mohammad Mithun, Chris Gayle, Alex Hales, AB de Villiers, Shafiul Islam, Sohag Gazi, Farhad Reza, Mehedi Maruf, Ravi Bopara, Rilee Rossouw, Nahidul Islam, Nadif Chowdhury, Abul Hasan, Fardeen Hasan, Benny Howell, Sheldon Cottrell, Sean Williams. This will probably be the last game for the Rangpur Riders without AB de Villiers in this season. Rilee Rossouw has been consistent in this tournament with scores of 44*, 83, 20* and 76*. He might make things tough for the Rangpur Riders’ team management and cause a selection headache when AB de Villiers will join the team. Rilee Rossouw has to be the captain given his consistency. Despite Nicholas Pooran’s duck, he has to be among the first choice players for multiplier roles. The likes of Mohammad Saifuddin and Shaiful Islam can be considered as vice-captain. Afif Hossain can be a perfect alternative given his all-round skills. This game offers a variety of bowlers who are expected to be profited by a slower track. The likes of Sohail Tanvir, M Nazmul Hossain, Taskin Ahmed and Mashrafe Mortaza will be the first preferred among the lot.